Ending an era, Seattle Seahawks star safety Kam Chancellor has announced he has played his last down in the NFL, as a concerning neck injury has forced him to hang up the cleats. The famed Seahawk is closing the curtain on his eight-year career after his “final test” regarding the recent neck injury that forced him onto the Injured Reserve for Seattle’s final seven games “showed no healing,” per Chancellor’s tweet Sunday evening. NFL’s Ian Rapoport later reported Chancellor isn’t officially retiring but won’t be medically cleared to take the field again, which guarantees him $6.2 million this year and $5.2 million of his base salary in 2019. Replacing Chancellor’s marquee hitting ability and versatility won’t come easy for Seattle, and given the sheer level of his play and wide-ranging impact, it’ll take an army to fill his shoes. 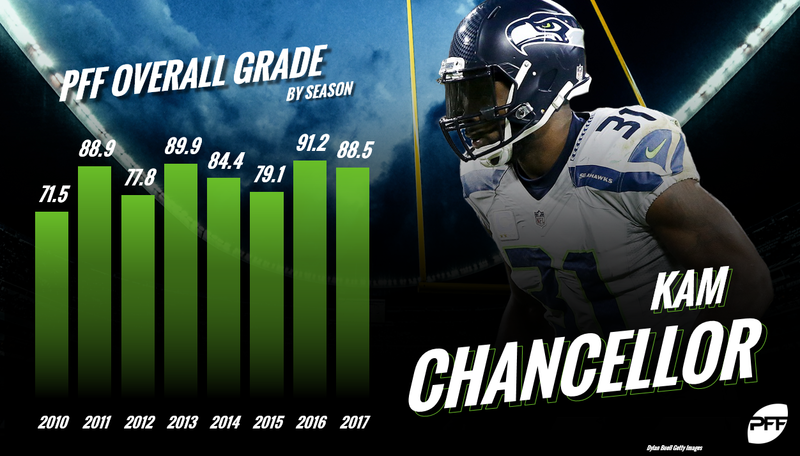 Prior to going down with the neck injury in Week 10 of last season, the 6-foot-3, 232-pound Chancellor thrived in his role as the defense’s Swiss Army Knife, as he earned an 88.5 overall grade while playing at least 40 defensive snaps at five different positions – free safety (192), off-ball linebacker (186), slot cornerback (89), edge (78) and strong safety (44). He also tested his talents along the boundary at outside cornerback to the tune of 27 defensive snaps in 2017. 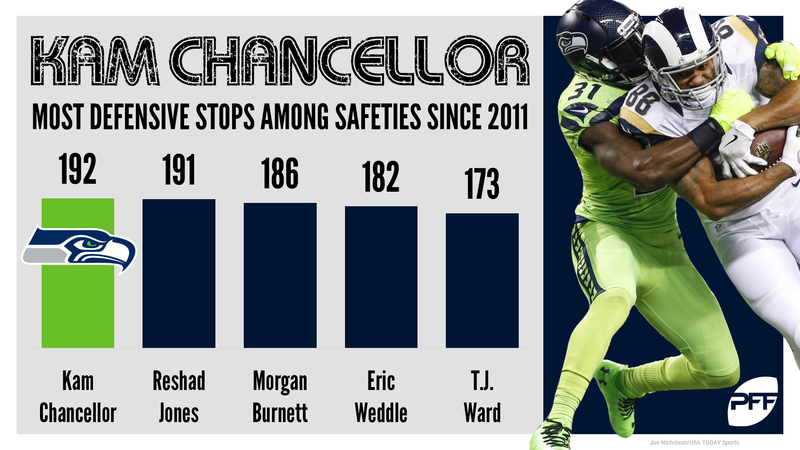 As such, Chancellor’s absence from Seattle’s defense doesn’t merely call for a replacement at free safety but could instead call for a bevy of talented defenders. Seahawks four-year NFL veteran Bradley McDougald, who signed a three-year, $13.5 million deal to stay in Seattle this offseason, was cast into a premier role in the team’s secondary in wake of Chancellor’s injury last season. The former undrafted Kansas product answered the call, exceeding expectations in coverage across multiple positions. He earned an 85.9 coverage grade and allowed just 7.3 yards per reception in 393 coverage snaps last season, ranking tied for 17th and tied for sixth among qualifying safeties, respectively. McDougald’s play in run defense, however, didn’t follow suit. He earned a 37.6 run-defense grade in his 280 run-defense snaps in 2017, which ranked 78th among the 82 qualifying safeties. Chancellor, on the other hand, ranked fifth in run-defense grade (84.2) among the same group. While McDougald will likely start in place of Chancellor in 2018, his presence in the run game may push him either off the field or far off the line of scrimmage on early downs, allowing for role players like 2017 third-round pick Delano Hill and rookie Shaquem Griffin to rotate in and play against the run. Playing a hybrid safety role in his final year with Michigan in 2016, Hill (6-foot-1, 219 pounds) earned a 81.9 run-defense grade and missed just five tackles in his 378 run-defense snaps. Griffin, though he primarily played along the edge of the defense at the line of scrimmage while at UCF, performed well in the trenches and proved he could go toe-to-toe with bigger guys up front, earning an 80.6 run-defense grade in 2017. A combination of McDougald as the go-to coverage defender and lead-off safety with Hill and Griffin filling in the gaps gives Seattle a fighting chance in replacing Chancellor in 2018. Of course, none of the three can truly match what Chancellor brought to the field in his career, an unfortunate certainty for all those trying to replace one of the PFF era’s best to do it.